Joan Silber’s novel Improvement wins the $15K PEN/Faulkner Award, only weeks after her National Book Critics Circle fiction award. “The art of this exquisite novel rests in Silber’s ability to weave the lives of her characters together into a complete whole, providing readers with intimate glimpses into the delicate and often unseen challenges of unassuming, everyday people,” the judges noted. Anthony Marra says he will use his $50K Simpson Family Award for midcareer authors “to finish my current project, a historical novel about the community of European refugees and exiles in 1940s Hollywood. This is my first work set in America, and though midcentury Los Angeles (‘Sunny Siberia,’ as exiles called it) is new terrain, this novel is preoccupied with the same concerns as my previous books: political coercion, historical amnesia, and falsified realities. At a time when these themes dominate American political life, this novel and the questions it raises feel all the more urgent to me.” The shortlist for the lucrative International Dublin Literary Award, worth about $122.4K, includes Elizabeth Strout for My Name Is Lucy Barton, Eimear McBride’s The Lesser Bohemians, and Han Kang’s Human Acts. 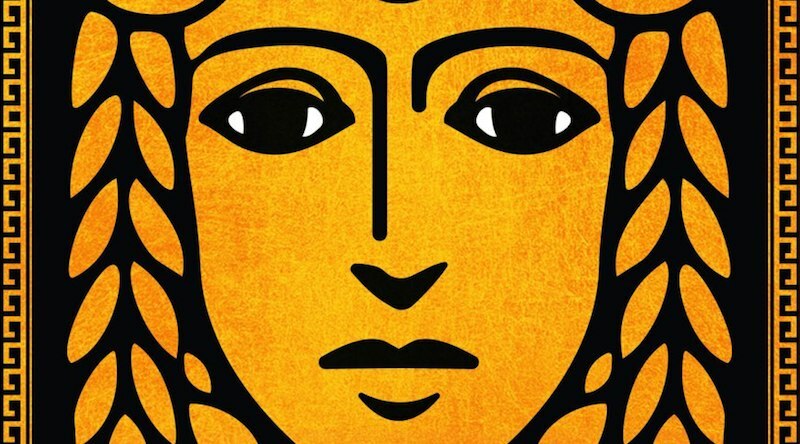 Madeline Miller plumbs the Greek myths for a new novel from a female perspective; Michelle Dean creates a group portrait of twentieth-century women critics, Yunte Huang’s biography of Siamese twins Chang and Eng “has volcanoes, earthquakes and a solar eclipse; epidemics, revivals and slave rebellions,” Charles Frazier’s Varina transforms the wife of Jefferson Davis into “a symbol of grit and wit, open-mindedness and tolerance,” and Angolan novelist Ondjaki sets his new novel in his hometown of Luanda. In her Circe, Miller has made a collage out of a variety of source materials—from Ovid to Homer to another lost epic, the Telegony – but the guiding instinct here is to re-present the classics from the perspective of the women involved in them, and to do so in a way that makes these age-old texts thrum with contemporary relevance. 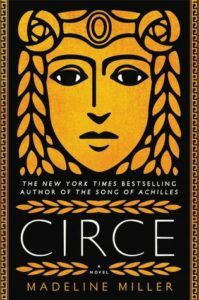 If you read this book expecting a masterpiece to rival the originals, you’ll be disappointed; Circe is, instead, a romp, an airy delight, a novel to be gobbled greedily in a single sitting. 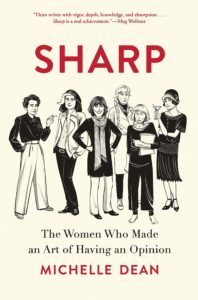 The word [“sharp”] isn’t always complimentary. It implies intelligence and perception, but also danger and even violence, as in the blade of a knife. All of these women could wield a pen like a weapon, and one of the book’s most delicious pleasures is in reading about battles between critics. 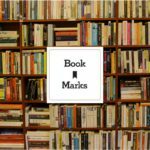 These days, book reviewers tend to avoid negativity or controversy—whether because we fear being ostracized on social media or worry about losing future freelance assignments. But the women Dean profiles here were willing to be unpopular. That made them not only sharp, but brave. “In a happy case of it takes one to know one, Michelle Dean has delivered a penetrating book about penetrating American writers,” writes Jim Higgins (Milwaukee Journal-Sentinel). Learned and playful, Inseparable draws on Huang’s personal experiences and his astonishing literary and historical knowledge. 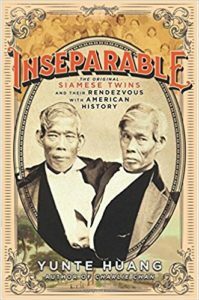 Inseparable has volcanoes, earthquakes and a solar eclipse; epidemics, revivals and slave rebellions. Bulwer Lytton, Flannery O’Connor, Tecumseh, Alexander Pope, King Rama II, Black Hawk, Mary Shelley, Victor Hugo, Nat Turner, P.T Barnum, Herman Melville, Mark Twain, Giambattista Vico, and Andy Griffith and Gomer Pyle all come into the story. Jane Austen makes a surprise appearance to introduce the seductive value of the good farmhouse Chang and Eng built to welcome their brides, Sarah and Adelaide Yates. Frazier’s Civil War novel Cold Mountain won the National Book Award in 1997; the film won an Academy Award. He returns to that crucial point in American history for his new novel. This novel has much to offer those of us who are living through what Carl Bernstein has taken to calling a “cold civil war,” but in the end it is a finely wrought novel that will reward rereading. 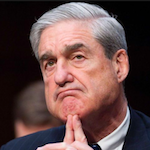 Elegiac without being exculpatory, it is an indictment of complicity without ignoring the historic complexity of the great evil at the core of American history. The Angolan author’s third novel, set in his hometown of Luanda, won the 2013 José Saramago Prize, the 2015 Prix Transfuge du Meilleur Roman Africain, and a Prix Littérature-Monde at the 2016 St. Malo literary festival. 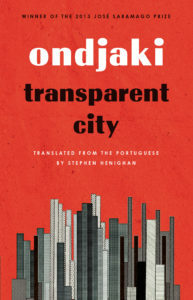 “Ondjaki transports us to Transparent City,” writes Sloane Crosley (Vanity Fair).